Foursquare probably expected this and thus agreed on collaborating with Facebook on the Facebook Places project. Facebook is the biggest social network in the world and also has the biggest mobile market share and that’s paying off for Foursquare too. 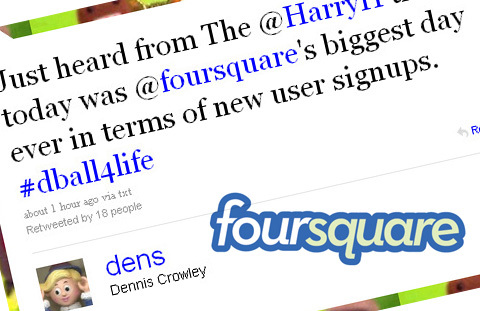 Foursquare co-founder Dennis Crowley tweetd earlier today that Foursquare set a new record of user signups within hours of the release of Facebook Places. Location based services are still new and ‘Check-in’ though is fast becoming a common phrase in the tech world but it’s still in its initial stages. Majority of social media users are only beginning to pay attention and trying to find out what the phenomenon actually is. With Facebook stepping in, location and check-ins have gotten the world’s attention and it’s obvious that all the fresh Foursquare signups are inquisitive users wanting to find about the phenomenon from the original source and also compare and better understand the usage. Foursquare is justified in celebrating but its user count is just about reaching 3 million which is a drop compared to the massive ocean of 500 million Facebook users. It can’t compete with Facebook just yet and probably realising and understanding that, Foursquare wisely agreed to receive all the advantages that their collaboration had the potential to bring.